Capegard-500 (Capecitabine) is a chemotherapeutic medicine used to treat metastatic colorectal cancer, Dukes' stage C colon cancer and breast cancer. It works by interfering with the growth of cancer cells. Capegard-500 (Capecitabine) is a chemotherapeutic medicine used to treat metastatic colorectal cancer, Dukes' stage C colon cancer and breast cancer. It works by interfering with the growth of cancer cells. Patients have also been treated with this medicine for stomach cancer and it has been studied as a potential treatment for pancreatic cancer. Treatment cycles with this medicine may involve use on its own (monotherapy) or combination with other anti-cancer drugs. This medication is in the cytotoxic antimetabolite category of drugs, however the main ingredient is a prodrug which is metabolised into 5-FU (its active form). This process occurs in the body and allows for 5-FU to be produced inside the cancerous tissue or tumour. Following this, it is able to cause a deficiency of a compound known as thymidine triphosphate which results in the inhibition of DNA synthesis. RNA synthesis is also disrupted. This inhibits the cancer cells production of genetic material and causes a deficiency in DNA and RNA. As a direct result of this, the cancer cells are unable to grow properly, thereby helping to treat the cancerous tissue. Even though this medication targets the cancerous cells specifically, other healthy cells may be affected, including blood cells. Patients may therefore require regular medical examinations which could include blood tests so as to ensure that no serious negative effects are being caused. 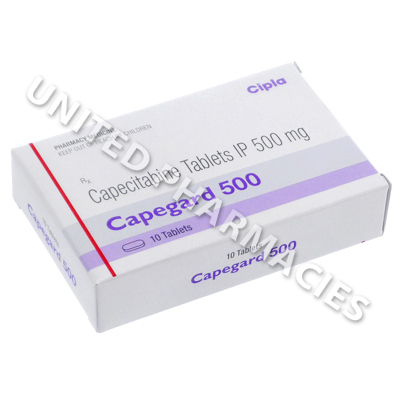 Capegard-500 (Capecitabine) is provided in tablet form and the medicine content of each one is 500mg. Patients are usually directed to take the tablets by mouth, within a half hour of eating a meal. The treatment regimen will be discussed in full by your doctor and the dosage regimen clearly explained to the patient. Patients are sometimes told by their doctor to take it twice per day on a cyclic basis. The exact amount of treatment cycles required will vary based on the severity of the condition and other factors. Sometimes, patients may be told to take it for 2 weeks followed by a 1 week rest from treatment. Ensure that you strictly comply with all dosage instructions given by your doctor and never exceed the recommended dosage. Other side effects are also possible. You will be required to see your doctor immediately or to get medical help should you be affected by diarrhoea, increased defecation, vomiting, pain affecting the limbs, sores on the mouth or any serious side effects that are not listed here. This cancer drug may react with anticoagulants, which could result in a severe reaction causing serious and possible life threatening bleeding. Patients may even be at risk of a reaction with anticoagulants for a certain period of time after finishing treatment with this medicine. If you suffer from certain side effects, it is possible that your doctor may recommend adjusting the dosage regimen or possibly ceasing treatment on a temporary basis so as to ensure that the side effects do not worsen. Always use Capegard-500 (Capecitabine) as you have been prescribed by your doctor. Never self-medicate or change your dosage without first consulting your doctor. The correct dosage can vary depending on your health, medical history, and the severity of the condition being treated.